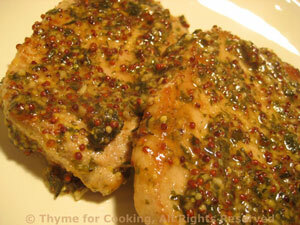 Pork Chops with Garlic and Mustard, Thyme for Cooking easy gourmet main course. The chops are browned first and get fork-tender in no time when gently braised. I prefer thinner, boneless chops for this skillet dish. They stay tender and moist, and the reduced sauce makes this a lovely main course. Mince garlic and parsley together. Stir into mustard, making a thick paste. Heat oil in nonstick skillet. Add chops and brown on both sides, about 10 minutes total. Spread half of the mustard on the chops, turn, spread the rest of the mustard on the other side. Add chicken stock, cover and simmer for 10 - 12 minutes over low heat, turning chops once. Remove chops, top with any sauce left in the skillet and serve.